Yes, but what is Gray’s destiny with her foreman-husband? Quads or maybe two sets of identical twins a year apart? To overcome the cynicism??? Gray hasn’t revealed the second part of her business plan — to manufacture the first virtual erasers — the e-raser! Perfect for deleting puffed sleeves from digital pictures. Plus, Gray has better shoes. You can tell a lot about a person by the shoes she wears. The choice of a red cut-out proves she’s an out-of-the-box thinker with a dynamic personality. Silly, simpering yellow never had a chance. I don’t do puffed sleeves myself, but I’m definitely making note of that gray dress. And the shoes. Gotta have the shoes. I would think the older sister would be the cynical one, after all, she’s the one who’s been on the Planet longer. Hum. My story is a bit shorter:Yellow: If she comes over here, I swear to god I’ll slap her face off.Gray: You go girl. And take your tacky shoes with you. I love the neckline. Not so much the poofy sleeves. These are hilarious… I particularly love the “cynical baby of the family” element in this one. It’s the pencil-eraser part of this that takes it to the genius level. Anybody could figure out that Miss Puffy Sleeves would marry the postman. Sheesh! Those red shoes ARE pretty spectacular! Loved the story. What’s the upstate NY connection? Does anyone really know what upstate NY is? Notice I said what, not where. Upstate NY is an idea, not a place. It’s what NYC people call the area outside of NY. Once you get an hour outside the city, people just call it New York. If the sisters lived in NY, but not in NYC, they wouldn’t refer to where they live as upstate. But why am I telling you all this. Who cares? Your story was great, and I’m thrilled that (upstate) NY was mentioned. Finally, a WTS where none of the players is suspected of having an Adam’s Apple! Hooray!Erin, you are single-handedly raising my morale this week. Thank you so much. I can’t wait to see what tomorrow brings. I can’t say why, but it strikes me that in another incarnation they were the sisters from The House of Elliott. 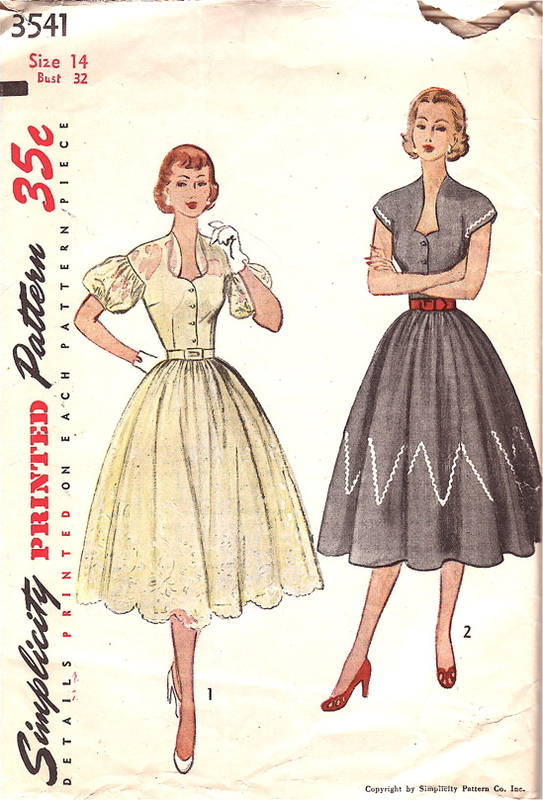 I have a question…many of these vintage patterns seem to say on the back that you can use a belt kit to make a matching belt…..is this something your ordinary housewife could pick up at the 5 10 and just up and do, back then? Did you need to hammer graumets in? Special machine and needles to sew through all the materials? Do they still make belt kits today, along vintage lines? It sounds daunting, but the finished product would be fabulous! It also means if you buy a vintage dress thats missing its belt, you could steal fabric from the hem and turn out a new belt, using a belt kit! What Im saying is, I want a few dozen. Yellow Dress: RicRac and red shoes? Is she kidding?Gray Dress: Let the square dance begin! EEEEhaw! Cookie: Yes, you used to be able to buy belt kits and they were very simple to make. You could put in grommets and for some even cover the buckle with matching fabric. I haven’t looked for one lately but fabric/sewing stores might have them yet. Gray is a dead ringer for Betty Draper.Re: Upstate New York – we folks who live in NYS but not in NYC, often refer to where we live as upstate to out-of-staters who might otherwise assume we meant NYC. I think “I don’t know who she thinks she’s fooling with those sleeves” needs to become everyone’s new catchphrase. My Grandparents lived in “Upstate NY – Pleasant Valley to pe precise — outside of Poughkepsie. Gray: Oh, honey. I wasn’t going to say anything, you need to start dressing like an adult. Sheer fabric, white shoes, puffed sleeves, gloves, bangs, and a matchy belt? I enjoy whimsy; heck, I’ve got rickrack up the wazoo and all of my accessories are red-down to my nail polish, but if we put a veil on you, you’d look like you’re going to First Communion. Less is more, darling. Yellow: Ah’ve always relahed on the kahndness of strangahs. Don’t know how you think ’em up, Erin! @ Melissa: Just what I was thinking.Clearly Gray Dress is called Stella! Married the factory forman?You mean that guy with the rolled up sleeves, half a ciggy hanging out of his mouth and jeans that REALLY fit? My uncle lives in Putnam County! @Nora: Ah, but I suspect the movie’s already been made! It’s Sabrina, with Audrey Hepburn…and with William Holden as Yellow, and Humphrey Bogart as Gray. ;o)These redactions of paper pattern ladies’ lives have been, by the way, hilarious and startlingly believeable and just generallly a treat. Yay! I want to see the movie!! I love your stories . . . when’s the book of pattern-inspired stories coming out?! I’m sorry to be so crude, but it’s clear that Yellow is trying to supress a fart. From the expression on Grey’s face, we know Yellow is not succeeding. I am truly sorry, but it’s the first thing I thought when I looked at the picture. I have been reading your blog for almost a year. I love it. This week’s stories have me BUSTing out with loud gawfaws. And, thanks to you and a few of your links which has led to a further few hundred links and beautiful sewing blogs and tutorials, I have decided to try my hand at garment making, picking up a hobby I put down 30 years ago, which I never was very good at. In the last two weeks (I was out of town) I visited a variety of stores and have collected a wee stash of lovelies and a few patterns. Now, to figure out how to make a FBA. That one scares me. Slash the pattern here, slash there. Sounds like a story-line for one of your patterns.Thank you. Oh, and my name ‘Remnant’ is one I use as a reminder that the Lord has saved a “Remnant” out of Israel for his own….however, I find it apropos for this sewing blog as well. Cookie, you can still get those “cover your own belt!” kits. I don’t know if they’re made by Dritz, but they’re usually hanging on the pegboard with all the rest of the Sewing Notions family. They come with the buckle, stuff to make the buckle cover if it’s a “covered buckle” kind of belt, and the stiffening, which can be sewn with your regular sewing machine needles. If you’re making your own dresses and can’t be bothered, you can also still find business that will cover the belts FOR you, for a very modest fee. Generally, that kind of store will ALSO cover buttons for you as well! Ah, the possibilities. I know there’s at least one place in Philly that does that; there may be more, and there may be some in your home town. You can usually find ads in the back of sewing magazines for mail-order places that do it, too. anonymous butterfly says…hi out there, I’ve been searching for this pattern, haven’t had much luck as of yet, has anyone been able to find this? Please help if you no of a place or site to purchase this…any help would be appreciated!